Sorry about the lack of post yesterday, I've seem to come down with a bit of a cold. Oh well, the show must go on! This week I'm going to talk about the leaders of this wild horde of sweaty beasts. 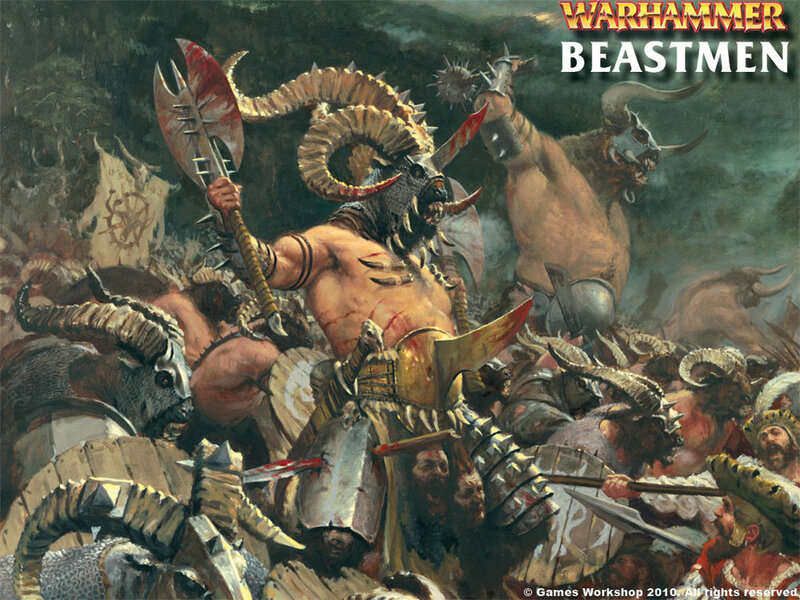 Beastlord: This is the standard leader of a Beastman army. He has very respectable close combat stats, is hard to kill and has the highest LD in your army, 9. I personally equip mine defensively, since keeping that LD9 alive as long as possible is very important, and I always give him the Crown of Command to make him Stubborn. My usual equipment is a shield, Armor of Destiny, Sword of Battle and Crown of Command. That gives him a little extra offensive potential, keeps him alive and keeps his unit in the fight. Great Bray Shaman: A pretty standard level 3/4 on the surface, but secretly a decent close combat fighter! With 2 attacks, a good WS and access to an additional hand weapon, this caster can actually put up a decent fight when needed. I tend to take advantage of this and give him a magic weapon and the Jagged Dagger, which gives you a token each time you kill a model, those tokens may later be expended for more power dice. Lore of Beasts and Shadow are the best options for Beastmen, and I tend to give Beasts to my GBS since he can cast the higher level spells with less difficulty than the level 2's. My typical equipment is a Jagged Dagger, Talisman of Preservation, Brass Cleaver and Ironcurse Icon. This gives him between 3 and 5 attacks, and with Savage Beast of Horros that's up to 8, and each kill gives you an extra power dice. I love it. Doombull: If you want a character with some close combat punch, look no further than the Doombull. His stats are astonishing and he will likely pulverize anything he wants into a fine paste. I generally don't take him since I like my LD 9, but if you're running a minotaur heavy army, why not take the biggest minotaur money can buy? Try giving him the Axes of Khorgor, Armor of Destiny and Potion of Speed for a really nasty ball of love and bloodshed. Wargor: For a hero, these guys aren't bad. They're as you'd expect, tougher than a gor, but not as tough as a Beastlord. I typically only take them for BSB's, since they don't have any other fancy rules to add. My BSB has The Beast Banner, Heavy Armor, Shield and Gnarled Hide, making for a 2+ save and giving his whole unit +1S. The Beast Banner is one of the hidden gems of the book, though it is expensive. Having a horde of 30+ gors dealing 40 attacks that hit on 3/4's with re-rolls and wounds on 3/4's is huge! Also, that extra strength knocks down armor a bit an added bonus. As tempting as it is, don't bother putting this unit in your Bestigors, they're already S6 and there is very little that S7 will do that S6 can't. Bray Shaman: This is our level 1/2 caster, with access to the same lords as the level 4, just in a smaller, cheaper package. Typically, I use lore of Shadow on my Level 2's and just go straight for the hexes. These hexes are crucial for Beastmen, as they give your units the edge in combat. With 2 level 2's, I frequently get both the S and the T debuff, and both always have Miasma. The difference between hitting the enemy of 3 vs 4 is huge, and you can also make it so you're hit back on 5's! This is very important for Beastman survival, because while they are T4, they have no armor to speak of. A common tactic is to take the Shard of the Herdstone, as well as several level 1 shadow casters to maximize the effect and generate a ton of extra power dice. While it does perform well for most people, it's not really my style since I prefer to keep my casters mobile, but it's fun to try from time to time. Gorebull: Another monster in close combat, the Gorebull is a beast to behold. Already having an impressive stat line, like the Doombull, he doesn't have much to improve. If you're running a minotaur heavy list, this will probably be your BSB. For a fighty Gorebull, I prefer the Black Plate, Ironcurse Icon and Sword of Swift Slaying, that allows him to hit fast and hard, as well as give his unit of minotaurs some additional protection from flaming or warmachine attacks. Generally, I don't use the Minotaur characters, since I don't run minotaurs to put them in. When I select characters, I try to have one in each of my combat blocks to give them a bit of something extra. One block of Gors has the Beastlord, so they become the tarpit, my other block of Gors has the BSB, so they do more in combat than expected, and my block of Bestigors has the Great Bray Shaman in there, allowing him to kill some guys at higher initiative and generate those power dice. If your enemy can't tell which of your blocks is most dangerous, then you're doing a good job. There you have it, hopefully this gets you on your way to your own wild host of nastiness. Now go forth, burn, pillage, defecate and multiply!